It’s no surprise The Film Society of Lincoln Center offers an annual festival of French films. The French are to cinema what Cuba is to cigars. Other countries produce them, but not quite like France. They birthed cinema. Now, France aims to deliver audiences a new era of storytelling: the age of transmedia. Transmedia is the art of sharing stories over multiple media platforms. Channels include online videos, comic books, mobile devices, alternate reality games, books, puzzles, and social media. In 2012, The Film Society of Lincoln Center decided to explore this media mixing and launched Convergence as part of The New York Film Festival. Over two days, immersive theater, interactive group video games, and panels on film and television extensions took over the Elinor Bunin Munroe Film Center. Thus began an exploration of the shift in storytelling in the 21st century. After the success of Convergence, The Film Society looked for ways to develop this examination beyond its annual fall festival. Knowing transmedia isn’t solely American, the next clear step was highlighting transmedia work from around the world. With Rendez-vous with French Cinema on their season’s horizon, a special project came into focus. 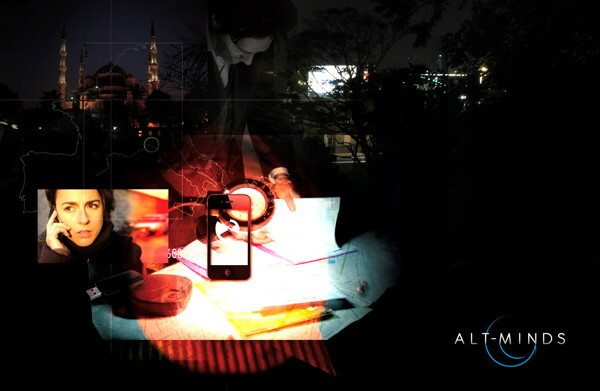 ALT_MINDS is a fast-paced immersive experience that casts the audience in the role of an investigator. Creator Eric Viennot requires the audience to engage in the action and play an integral part in the expanding narrative. When six promising scientists disappear while on assignment, their kidnapping sparks a manhunt across Europe. Mysterious online videos, mind bending puzzles, and clues point to a dark conspiracy that threatens to ensnare the team of investigators charged with unraveling the mystery. A big hurdle for this kind of mobile-based multi-platform storytelling is distribution in the United States. There aren’t many companies taking the risk. In France, ALT_MINDS received development support and distribution through the communications company Orange. Additionally, artists receive government support more easily. Between corporate and government support, creators like Mr. Viennot have more opportunities than American creators. That is one of the reasons The Film Society at Lincoln Center is offering this special event as part of Rendez-vous with French Cinema. They want to introduce this innovative work to an American audience. To sneak a peek at the next exciting revelation in cinematic storytelling, stop by ALT_MINDS and the art of French Transmedia on March 2. Creator Eric Viennot presents the project and offers a sample of what players experienced. He will also screen a portion of the web series and discuss how French creation is different from the United States. For more information about ALT_MINDS and the Art of French Transmedia, visit The Film Society of Lincoln Center’s website.